St. John's and surrounding areas were spared the rain, but not the high winds. Post-tropical storm Chris ended up taking a different path than initially projected over Newfoundland — sparing St. John's, but hammering central parts of the island with heavy rain. "[It] took a more westward track ... [ended up] moving through Placentia Bay right up through Trinity Bay," says Wanda Batten, a meteorologist with the Gander weather office. "That made a massive difference in what we saw in regards to precipitation and winds over pretty much most of Newfoundland." Batten said Gander recorded the most rain, with 76 millimetres falling, followed by Bonavista which got 61 millimetres. "It dropped off quite significantly as you got to the Avalon, we got significant less precipitation than what I was expecting. Everything shifted further west." 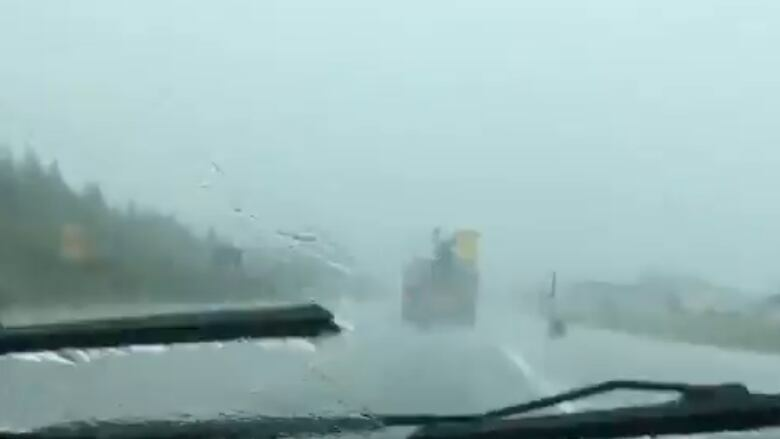 Though St. John's and surrounding areas may not have been pelted with the heavy downpour initially expected, there was still some fierce weather to contend with. "[St. John's] you dodged the precipitation man, that's for sure, but you weren't spared from the winds," said Batten. She said the biggest gusts were around the Avalon peninsula and southern areas of Newfoundland, including 96 km/h in Ferryland and 91 km/h recorded at the St. John's International Airport. The cooler temperatures the system brought to the Avalon will warm up by Sunday or Monday, Batten said. The winds will diminish quickly, too, by Friday early afternoon. As of Friday morning, Chris is on the move, toward Funk Island, off the northeast coast of Newfoundland, said Batten. "He is going to depart fairly quickly throughout the morning today, so goodbye," she said.